Upasana Agarwal’s artwork, commissioned for this year-end special of Lounge, reflects this need for solidarity within the larger community. 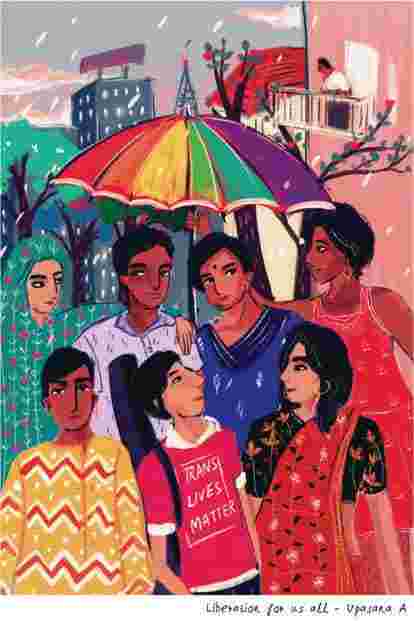 While protests are going on around the country against the Transgender Persons (Rights and Protections) Bill 2016 that was passed by the Centre on 17 December, Kolkata-based artist Upasana Agarwal, 23, feels the larger LGBTQ+ community needs to be more supportive of trans-rights. Agarwal says trans-activism has made wider queer rights activism possible. “It is because of their work, that many of us, trans or just queer folk of this generation, are able to exist somewhat more freely than previous generations perhaps. If you look at the Trans Bill protests across the country, the sheer numbers are lacking. Support is lacking. It could be just a 100-150 folks coming for a rally about trans-rights, but for Pride you have 10,000 people in Delhi." Her artwork, commissioned for this year-end special of Lounge, reflects this need for solidarity within the larger community. “So there’s obviously a lot of work that more privileged individuals within the LGBTQ spectrum have to do to include those whose voices are not heard, mostly because we’re hogging that space or taking up that space in the first place. So my piece is essentially about that," she says. Although the artwork depicts an urban milieu, Agarwal says the focus needs to turn from the metropolises to the districts where a lot of grassroots trans activism takes place, often under difficult circumstances. “We always end up talking about the metropolis. And urban spaces can be very inaccessible sort of spaces. I was really trying to see how we can find a way, just join hands and take it from there. How do we make ourselves more accessible as people?" she asks.